Want to get your kids to practice math, handwriting, sounding out words, sleuthing and have fun all at the same time? This secret code activity is for you. I’ve been wanting to do secret codes with the kids for a while, and since it fit the bill of this week’s STEAM POWER theme of “compute,” the timing was right. 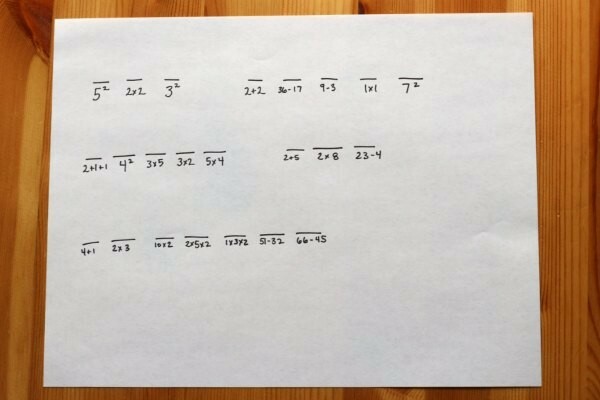 This secret code formula is a basic one you will no doubt recognize from your own childhood. I got the idea to use a slider from the Top Secret: A Handbook of Codes, Ciphers and Secret Writing, a book my son has been enjoying. It has all sorts of goodies in it for your spy-in-training. You can probably figure it how to make it by looking at the photo, you are so clever. The key is to make the strip longer than the colored paper and to cut slits that are slightly larger than the strip, so it glides smoothly. 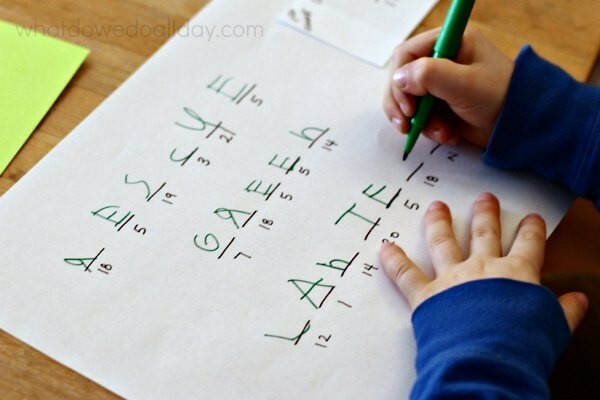 Write the alphabet on the colored paper. 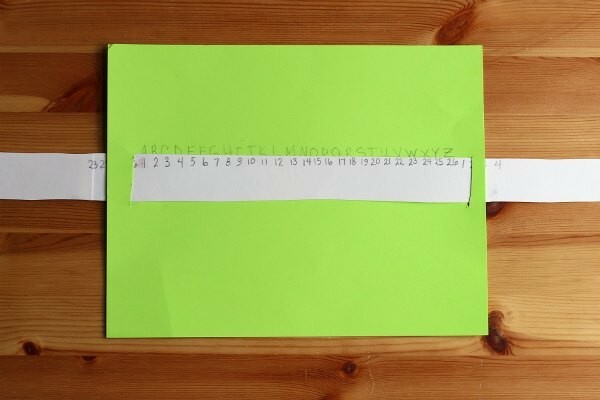 I put an alphabet on one side of the strip and a number line on the other, with extra letters and numbers on each end, as shown. I probably don’t have to explain how to create the codes to you clever, clever people. There are several ways to keep things interesting. Line up the alphabet to the numbers so that A=1, Z=26, etc. This will help kids practice one to one correspondence. In other words, CAT would be written 3-1-20. Lining up the alphabet to alphabet or alphabet to number line, the slider can be moved back and forth. A new code might be “number line +1” so that A=2 and so forth. So, CAT would be 4-2-21. “Alphabet +1” would be A=B, so CAT is written DBU. 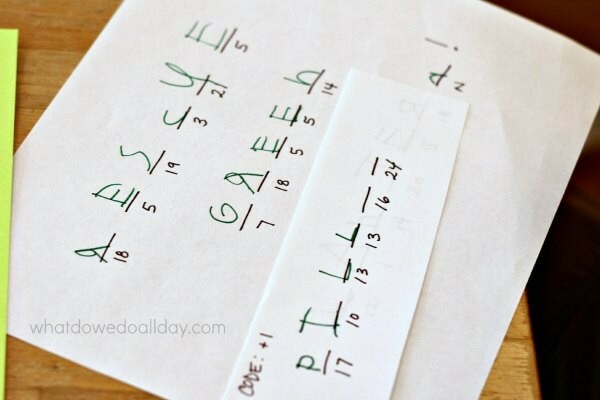 You can see how your kids can use this formula to come up with different codes. For my youngest son I kept the codes at the “ever so slightly more challenging” level, but for my older kids, a fun way to have them practice their “power facts” (as they are called at our school) is to add a computing level to the decoding process. So for example, using the A=1 code, I would write the clue for CAT as 1×3 1×1 4×5. You can, of course make these equations simple or complex to suit your child’s skill. And perhaps, your child will even write something in code for you to crack! 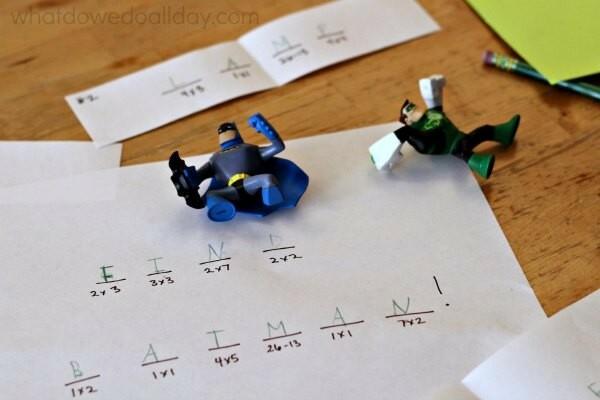 I made several messages for the kids to decode, but then I hit upon the idea of a scavenger hunt with superheroes. I created coded messages for the kids: “Find Batman” and “Rescue Green Lantern” and wrote a series of clues, which I then hid around the apartment. The boys decoded each clue, which led them to another coded clue, and so on until they found their action figures. So there you have it. 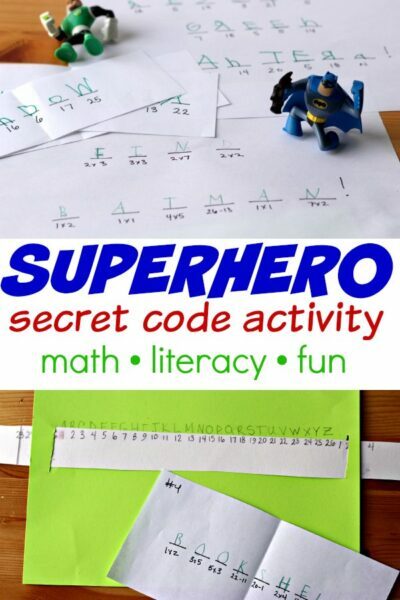 A super successful activity that combines math, handwriting, a bit of fun and perhaps a superhero or two. My next challenge is to get the boys to create coded scavenger hunts for each other. We shall see…..
Want more 52 more STEAM activities? Get the free list, plus step by step instructions for 2 sample projects. Sign up here. 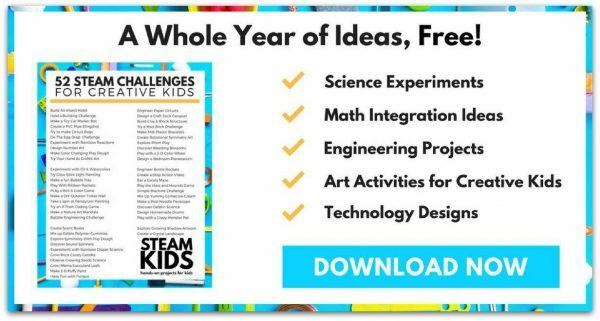 Put your kids’ brains on compute mode with more STEAM projects from the STEAM POWER team! « Superhero Science Activities: Test Your Powers! I cannot even tell you how fabulous you are for posting this today! Spring Break starts at 3:40 tomorrow afternoon and I had no clue what I was going to do with my girls. (The week kind of snuck up on me!) Problem solved!! They will love this, especially my 8 year old. Thank you so much for sharing your great ideas. Hooray! I’m so glad it will help you get through Spring Break! Thanks for your comment. Who doesn’t love secret codes? I love the tie-in to superheroes too!